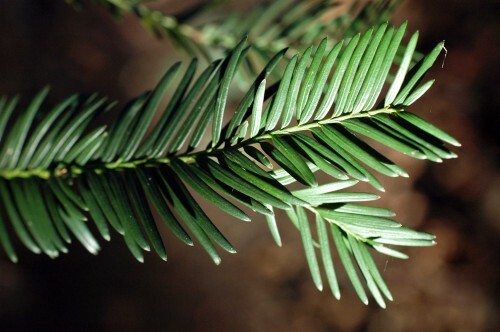 There are just three species of conifer that are true natives of Britain; the Yew-Taxus baccata, the Juniper-Juniperus communis and the Scots Pine-Pinus sylvestris. 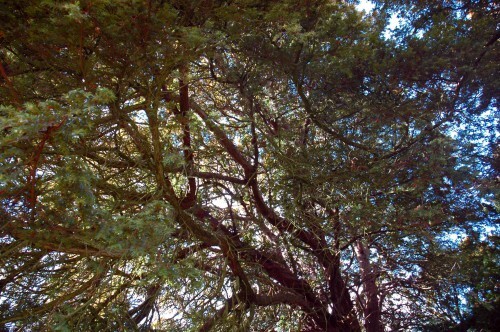 All of them are found growing ‘in the wild’ in this part of North Wales, but of the three species it is the Yew that predominates. 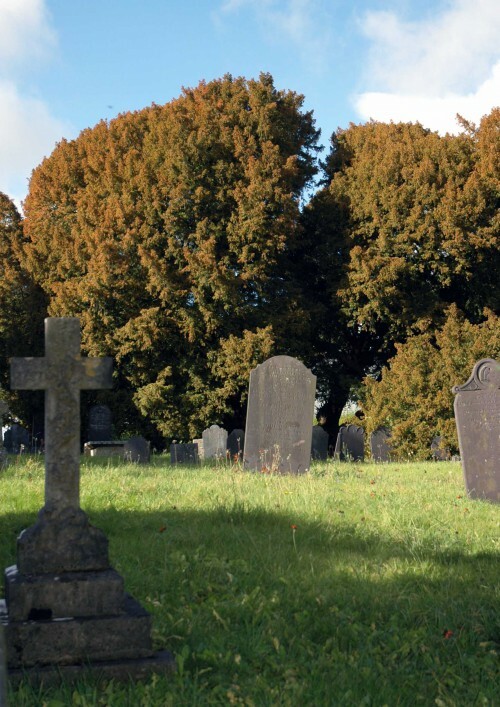 The Yew tree is a familiar sight in many churchyards throughout Great Britain and some are even older than the Christian faith itself due to their ability to regenerate and regrow. 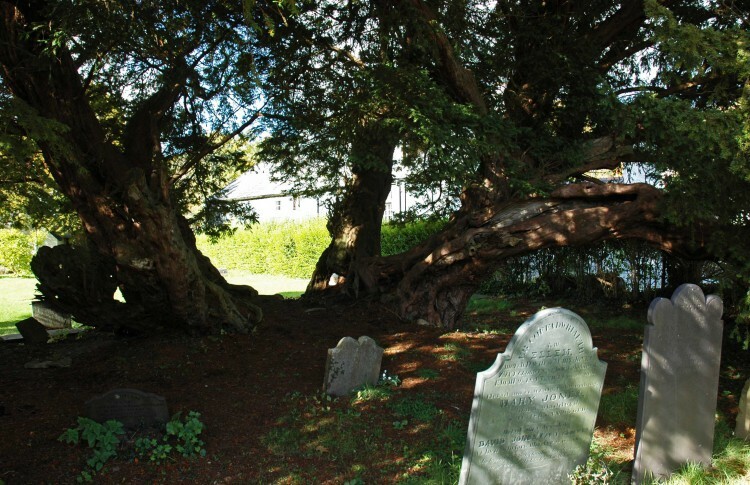 Wales is one of the most significant places in Europe for ancient and veteran yew trees and most are found in churchyards. 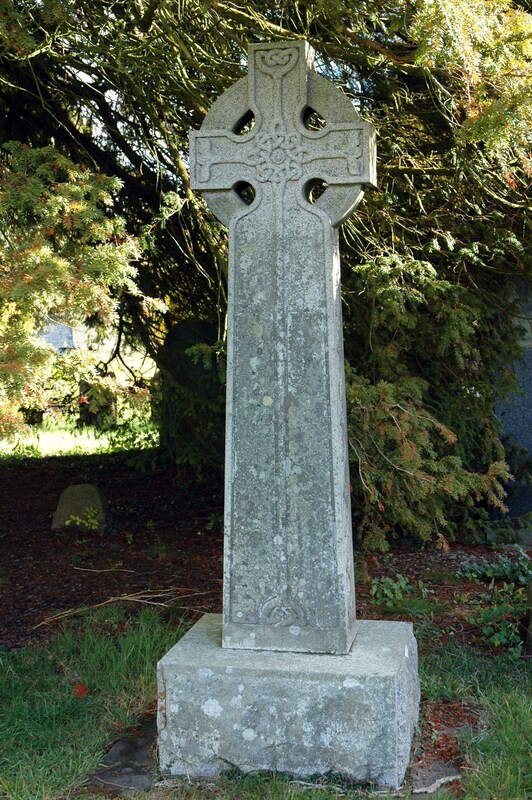 Sacred to Druids and Celts, yews would have marked venerated places in pre-history, many of which became Christian sites later on. Our wet climate and lower light levels led to a deeper veneration of one of the few native evergreen plants. The subject of this post is the most ancient of them all. 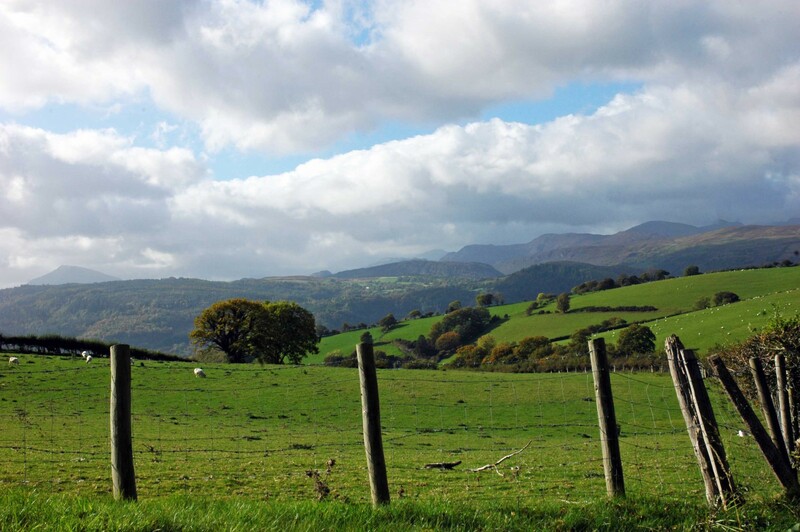 It is located in the churchyard of St. Digain’s in the small village of Llangernyw, sited in the Elwy Valley in Conwy county, which I went to see on a lovely day at the end of last autumn. This amazing tree is recognised as the oldest known tree in Wales and England and furthermore, at an estimated 4,000 years old as one of the oldest living things in the world. There are no barriers or signs prohibiting you from approaching or touching the tree, which is a rare privilege in itself, but to be in the presence of a living entity that may have begun its life in what was the Bronze Age in Britain is incredible. The tree is male, so bears no berries. The body of the tree is fragmented; its core part has been lost, leaving several enormous offshoots growing from its base, still thriving despite not always being treated with the respect it commands now. In the mid-1990s the church oil tank stood in the space between the two trunk fragments and much of the dead wood was removed from the site when the tank was built, which made dating the age of the tree more difficult for experts in the field (known as dendrochronologists). Thankfully the tank was removed when it was realised that the tree was ancient. 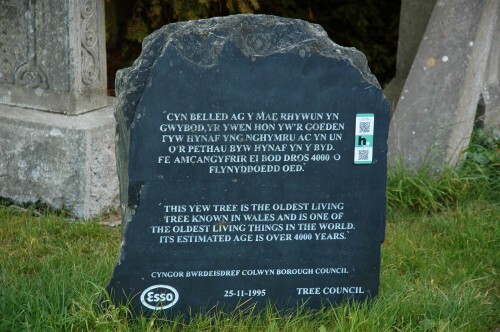 In 1995 a plaque was erected by the Tree Council giving the estimated age of the tree as just over 4,000 years; the age being determined by a calculation using a formula based on the girth if the tree, which is a mighty 12.5 metres, or 41 feet at ground level. 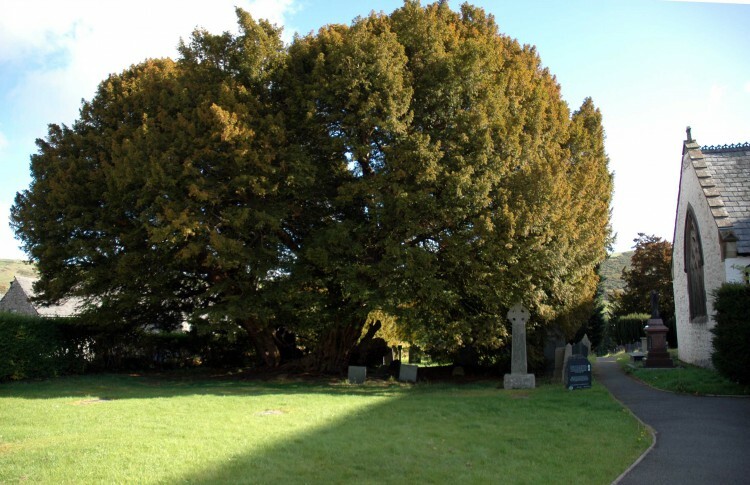 In June 2002, the tree was granted more recogntion by the Tree Council, in celebration of the Golden Jubilee of Queen Elizabeth II, it designated the Llangernyw Yew tree one of the Fifty Great British trees in recognition of its place in national heritage. 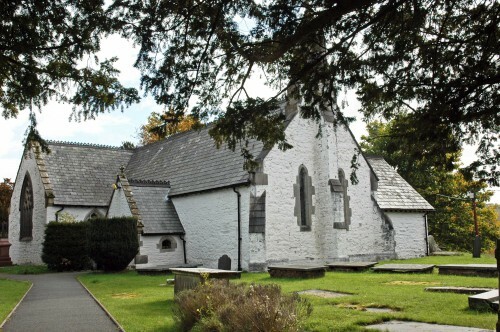 According to a survey by the Ancient Yew Group, the Church in Wales owns 334 yew trees which are more than 500-years-old, which they equate to owning 95% of all the Grade 1 listed buildings in Wales. The original church was founded here by Digain, son of Cystenyn Gorneu, a Saint of the 5th Century. Parts of the attractive building now standing date back to the early 15th century, including the roof construction, an interior door and the stoup. 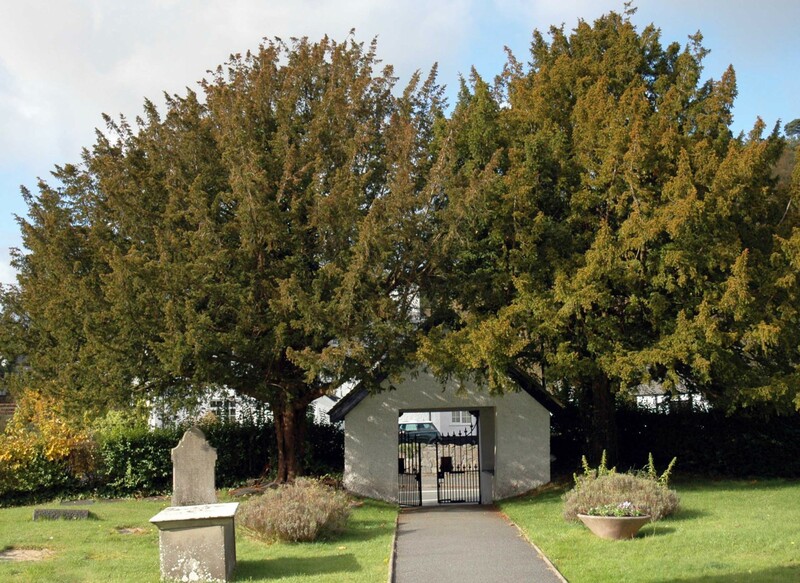 There are other yew trees growing within the site and the church is framed in the photograph above by trees that flank the lych gate. The lych gate was erected in 1745 at a cost of three pounds, fifteen shillings and sixpence in old money; £3.76p now. 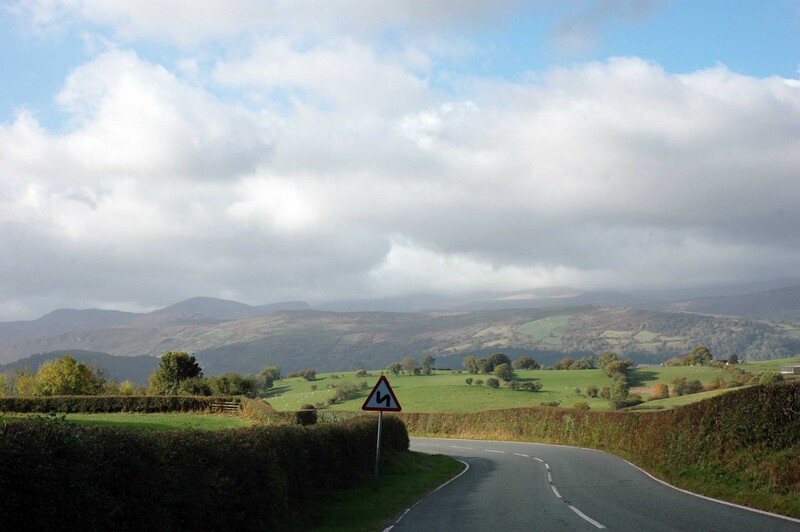 It’s well worth visiting Llangernyw for the wonderful scenery surrounding the village – the road from Abergele to Llanwrst is rightfully designated a ‘scenic route’. Before I go, I’d like to wish everyone a happy, healthy, peaceful 2016 and to thank all of those that have followed, commented and/or liked posts and pages on this blog during 2015. Thank you for your loyalty too; the recent lack of posts are due to a challenging health issue that presented itself in the last months of 2015, with no warning (! ), that will demand a few months more of treatment and may commute my meanderings to ‘potterings’. Posts may be erratic for a while, but the best therapy for me is getting out and about, so as and when weather permits I will be checking on what’s happening around me and keeping things current. Meanwhile I have a whole library of photographs to draw on and look forward to seeing and hearing what you are all up to. Thank you for your kind comments John. Such ancient living things put our short, frenetic span of life into a different perspective! Great essay Theresa; I’d wondered often about old growth trees on the island. Will share this post with my wife. Be well. Thanks for posting. Best wishes for a good recovery! How extraordinary to be in the presence of an entity living for 4000 years! Can but celebrate it’s venerable antiquity. Glad to see it designated as a national treasure, as well as those mere 500 year olds! Great post Theresa, and good wishes for a speedy recovery. Thank you. Yes indeed, it’s a rare privilege to be granted such an encounter and I was surprised that apart from the plaque, the tree’s presence is quite understated. Perhaps that’s the key to its survival though. Best wishes to you. I really enjoyed your article and photos, Theresa. I hope your rehabilitation goes as planned. Happy 2016 to you and may you continue with your trails with a care free heart, very soon. Sorry to hear you have not been well, hope the treatment goes well and you are able to take some excursions outside in nature to help with your recovery. Thank you Emily, I’m lucky I don’t have to go far to be surrounded by nature and being out in it it’s always been the best therapy for me, so I escape whenever weather permits, a bit like your bees! Hope you and they are coping with the confusing weather. 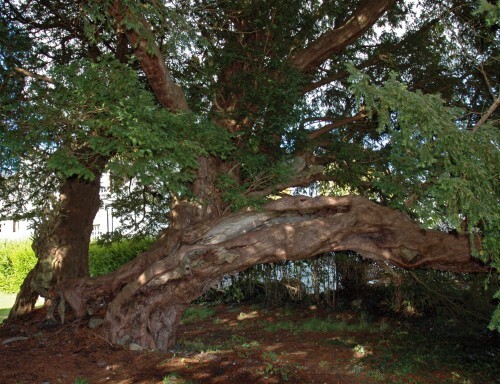 Yew trees are so special aren’t they, a real physical connection with the past – I love the way our folklore melts into history. A really interesting post. I’ve been reading about ancient sites with circular churchyards and yews inside the circle – excites all my history juices! Really hope you’re better soon Theresa, best wishes. Thank you Anny, they are amazing trees with a unique, strong presence. I looked at that ancient tree for ages to try to make sense of its great age, but it’s beyond imagination I think; if only it could speak! I wasn’t aware of circular churchyards with yews, so will definitely have to investigate that. Thank you for your good wishes and I hope your sadness is easing too. Happy New Year Teresa, I hope you get well soon. Your views from the Autumn are really beautiful and on a cold dreary day they are very heart warming. 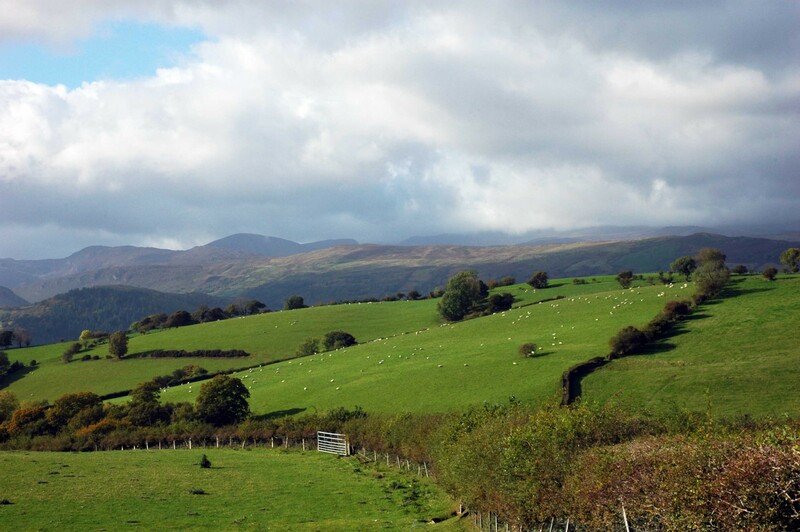 Thank you for your kind comments Julie, we did have a spectacular Autumn this year didn’t we? Keep pottering on Theresa and get well soon. Thank you, I think it helped that it was quite a dramatic day with sun but with atmospheric, cloudy skies over the mountains too.